AT&T SynJ SB67108 Cordless Expansion Handset for the AT&T SynJ SB67138 & SB67158 Small Business Phone System. DECT 6.0 Zero Blind Slot Digital Technology. 1 to 4 Line Capability. Push-to-Talk Intercom—From Base to Handset and From Hanset to Handset. Expandable System (use up to 10 cordless handsets through a single phone jack). 30 name and number Caller ID history. DSL Subscribers may need to us a DSL Filter. For optimal performance batteries should be charged for 16 hours prior to use. 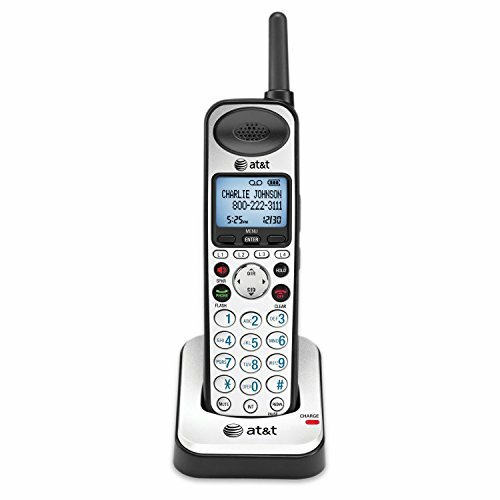 AT&T 4-Line Accessory Handset.